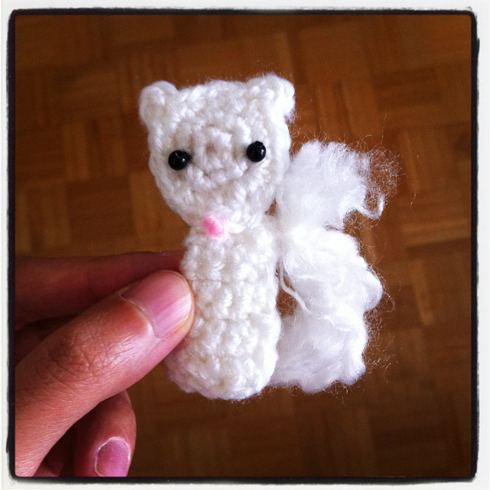 saturday is white squirrel day! Here comes the second pattern for the 12 Days of Woodland Creatures (and Their Favourite Things)! To the awesome visitors who have commented on my last post — thanks SO much for joining me in the crochet‐along! And to everyone — it is never too late to join in the fun (details here)! You can make all or a few or just one of the 12 creatures you like. It would be really great to see what everyone has created at the end! So, anyhoo, the elusive white squirrels are legendary creatures in Toronto’s Trinity Bellwoods Park (though I’m very sad :’( to find out that we just lost one recently). There is a street and a coffee shop in the neighbourhood named after the white squirrel. I have yet to encounter a real one, so I just keep making crocheted ones. Apparently there are also white squirrels in Exeter, Ontario, which are not albino with red eyes, like the Trinity Bellwoods squirrels, but just have white fur instead of the more common grey or black fur. So I suppose the white squirrel we’re making here today can be a variety of the Exeter squirrels. Actually, I chose to give the squirrel the regular black eyes because I’m making it for a baby mobile, and the thought of tiny red eyes staring down at the baby is just… a bit strange. The construction of this squirrel is rather simple. It’s made out of 4 pieces: 2 head pieces and 2 body pieces. Oh and a fluffy tail. Round 1: 6 sc in magic ring, sl st in first sc to join. Round 2: ch 1 (does not count as a stitch), 2 sc in each sc around, sl st in first sc to join. Round 3: 1 sc in each of first 3 sc, sc in next sc, ch 3 (this is an ear), sc in same sc, 1 sc in each of next 3 sc, sc in next sc, ch 3 (this is another ear), sc in same sc, 1 sc in each of next 2 sc, 2 sc in next sc, 2 dc tog over next 2 sc (this is the nose), ch 2, sc in the same st as first sc of the round, sl st in next sc, fasten off, weave in ends. *When finishing the 2nd head shape, leave a long tail for sewing. Row 1: sc in 2nd st from hook, 1 sc in each of next 2 sc, turn (3 sc). Row 2: ch 1 (does not count as a stitch), sc in each sc across, turn (3 sc). Row 4: ch 1, sc in first sc, 2 sc in next sc, sc in last sc, turn (4 sc). Row 5: ch 1, sc in each sc across, turn (4 sc). Row 6: ch 1, sc in each of next 2 sc, 2 sc in next sc, sc in last sc, turn (5 sc). Row 7: ch 1, sc in each of next 3 sc, 2 sc in next sc, sc in last sc, turn (6 sc). Row 8: ch 1, 2 sc tog 3 times, fasten off, weave in ends. *When finishing the 2nd body shape, leave a long tail for sewing. 1. 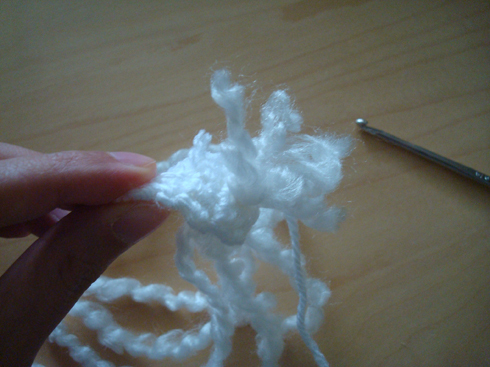 Cut 6 pieces of the fluffy white yarn, each about 5–6 inches long. 2. Find a gap between stitches in the lower centre of the squirrel body. 4. Tie the short ends together by pairing them up and tying each pair in double knots. 1. With all the short ends of the tail inside, sew the 2 pieces of body together. 2. Sew eyes and embroider nose on one head piece (I made a giant french knot with pink yarn for the nose). 3. Position the head pieces so that they sandwich the body, with the nose covering the top row (neck) of the body. Sew head together, and sewing through all head and body layers when you get to the neck/nose area. (If you’re making an ornament, you can make a loop with a piece of ribbon and sandwich it between the 2 head pieces at the top of the head before sewing the head together). Curl the tail up in a position that you like on the side of the body. Take one piece of yarn from the tail and pull it through a stitch on the edge of the body through the front, where the head and body meet, then take the same piece of yarn and wrap it loosely but securely around the entire tail once, then pull it through the same stitch on the body through the front again, and tie a knot at the stitch on the back to secure. Trim tail to the length you like. Your squirrel is adorable! (And so is your hedgehog!!) I’ve never seen a white squirrel! I was pretty excited the first (and only time) I’ve seen a black squirrel! hope you have a good weekend too, Kate!! we’re blessed with many many grey and black squirrels here in our part of Canada, i kind of take them for granted now… but i do remember seeing them for the first time when i was a kid, visiting Canada from Hong Kong, very exciting indeed! !